Storms, gales, rain, snow and even fog can produce stunning photographs – just follow these tips, and make sure you and your camera are prepared. Focusing on key features of the scene, whether that’s sheets of rain, a sharp reflection or a flowing body of water, is key when shooting landscapes in all weather, as is making the most of natural light. 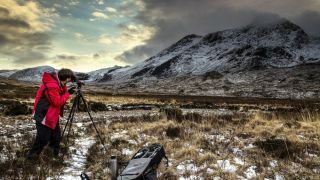 Producing moody, dramatic landscape photos means you and your gear will be out in demanding conditions. To protect your camera, you can buy rain covers such as those from Manfrotto or Storm Jacket. Or use a large, strong plastic bag (such as a bin liner) to cover the camera during the rain, then uncover it while you take a shot. Also pack lens cleaning cloths, microfiber towels for drying the outside of the camera, waterproof clothing – and a flask of hot coffee. Follow these steps to take stunning landscape photographs in any kind of weather. Look for the dominant feature in a scene, and use composition to make the most of it. Rain sweeping across the clouds can become a feature in its own right – it’s the most impressive feature of this wet weather shot, so placing the landscape to the bottom of the frame allowed the textures and detail in the sky to become the main focal point of the image. As there were breaks in the cloud near the sun, waiting for the light to break through illuminated the mountains and the sky here. An ethereal veil of mist or fog across the landscape is perfect for adding mystery and intrigue to your images. It usually occurs early in the morning, when there's a high-pressure system. Shooting inside the mist will reduce the landscape to a few graphic elements. Although they can be beautiful, fair cloudy conditions can produce the least dramatic images, especially during the middle of the day. But you can add drama by converting your images to black and white to add contrast to both the sky and landscape in your images. Generally associated with high-pressure systems, days without wind are perfect for creating more serene and calm landscapes. It’s the perfect time to capture reflections in lakes and still water, while at dawn and dusk there are often subtle tones and colors in the sky. Snow and ice can transform almost any landscape into a winter wonderland, but you still need to search out the right locations and compositions to create striking images. Shooting while snow is falling can create a more sombre mood, while clearer skies are more welcoming for striking images. The moody, menacing skies of a storm front passing over the landscape are perfect for creating the most dramatic shots. These are also the most likely conditions for capturing the drama of lightning or huge, crashing waves, which will add even more excitement to your landscapes.